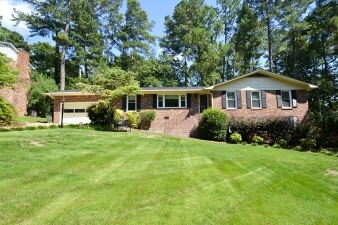 Nestled on .60 acre lot is this 4 bedroom, all-brick ranch home with an additional expansive bonus room/flex space with ½ bath. Owners have completed lots of recent improvements to include a New Roof-2018, New Tankless hot water heater-2015, New plumbing – 2017, New Carpet – 2015, New windows- 2015, and New gutters and leaf guards to just name a few! Inside find Kitchen for the family that loves to cook with extensive cabinetry, 8 ft. island boasting Zodiaq counter top, bar area, wine rack, and tiled back splash; beautiful hardwoods throughout most of the home; separate Family Room/Den offers a fireplace, built-in desk area and French doors that lead to a wonderful entertaining space; kids will love the beautiful Zeon Zoysia grass that feels like plush carpet in front yard; Master Bath has been renovated to include tiled shower with niche; tile flooring and dual sink vanity; separate Mudroom with sink and toilet; 2 car garage and more!